HABIT: Showy selection of a bushy native. 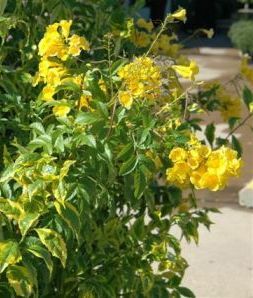 Blooms all summer with dramatic yellow flowers. CULTURE: Although technically a shrub, normally treated as a summer annual. Can be a perennial in hardiness zones 9 through 11, especially in an organic program, but and doesn't tolerate winter frost. Esperanza flowers abundantly in summer and early fall. Its yellow, tube-shaped flowers attract both bees and butterflies to the garden. USES: Large color plant for summer. PROBLEMS: Not very winter hardy.